Ever take long walks and really look at how weather affects nature? The passage of time takes its toll on trees, rocks and the earth and its those worn edges and surfaces that are the most interesting to me.....especially when rocks reveal their crystalline layers. Its wonderful when you can bring nature inside your home...a fresh cut of flowers, a shell collection or even a beautiful rock that you found on a walk one day. 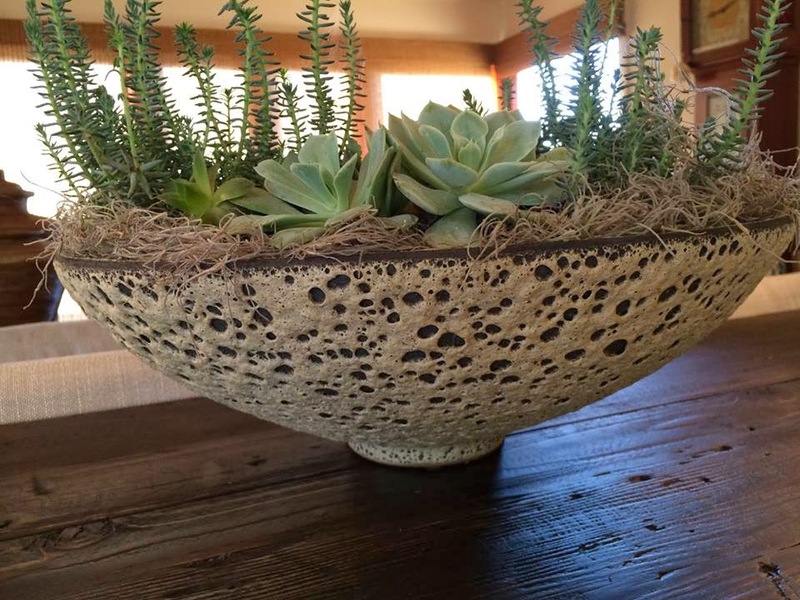 I have noticed that today's designers are now integrating geologic inspired designs into home interiors. The Agate for example is a beautiful stone and has become a hot trend. I have recently seen it used in lighting, stone surfaces and wall murals. The agate structure is composed of a banded nodule that is filled with a translucent, multicolored chalcedony. 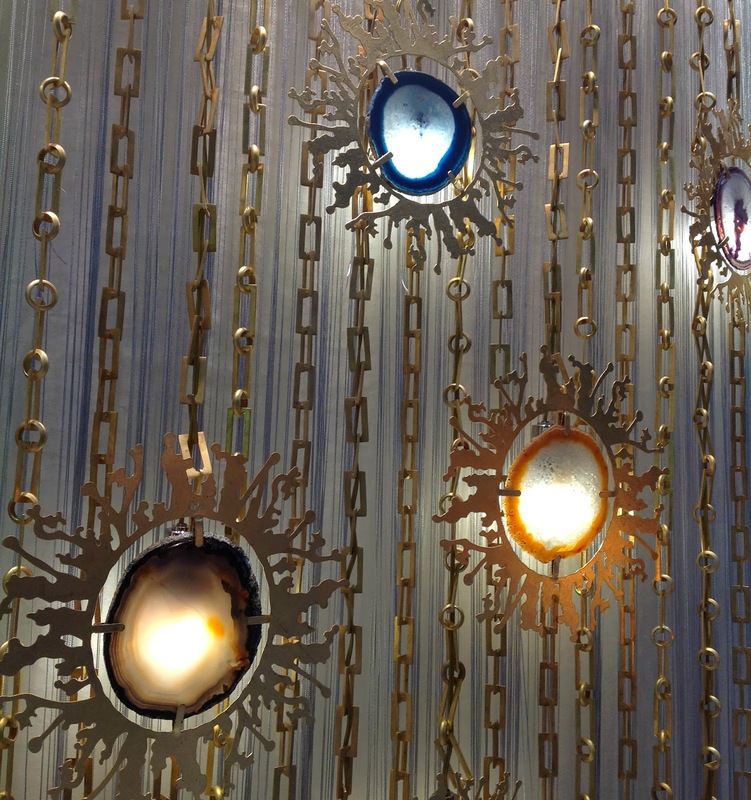 The parallel bands are so intense in color that the agate is like jewelry for the home.... Lusive Decor showed off the Balanchine collection at BDNY. Its multiple geometric brass chains suspend different unique agate structures ultimately creating a curtain wall of color and pattern.... Its affect is quite distinctive and beautifully ornamental. Caesar Stone makes an extraordinary stone surface collection called Concetto that blends art, nature's hues and design and technology. 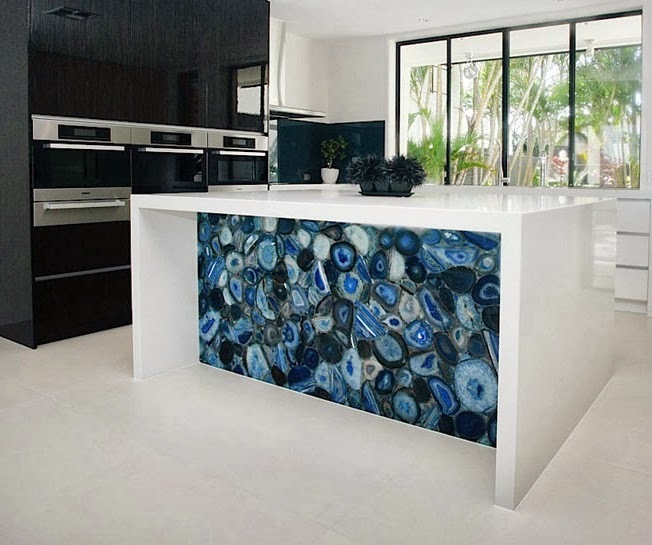 Its beautiful surface is hand-made from semi-precious stones.....oh my!...an ultra luxury stone surface. Its a wow stone! The colors are so intense that it would definitely be a conversation piece in your home. The wall mural company Pixers brings blank walls to life. Their murals are vivid, environmentally friendly and customizable. 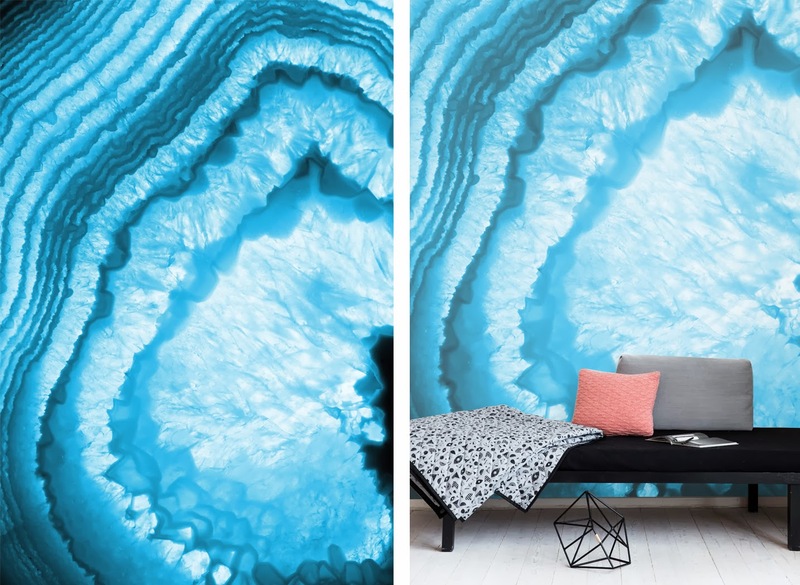 I love the deep blue colors in the Blue Agate mural above...it draws you into its crystallized surfaces and would make an uh-mazing backdrop. Ceramicist Josh Herman develops sculptural forms that come alive with his applied volcanic glaze. The innovative surface looks geologic, perhaps meteroic...pocketed with craters. His tubular forms are organic and dynamic.... wouldn't you want one of these distinctive sculptures in your home? Love it! 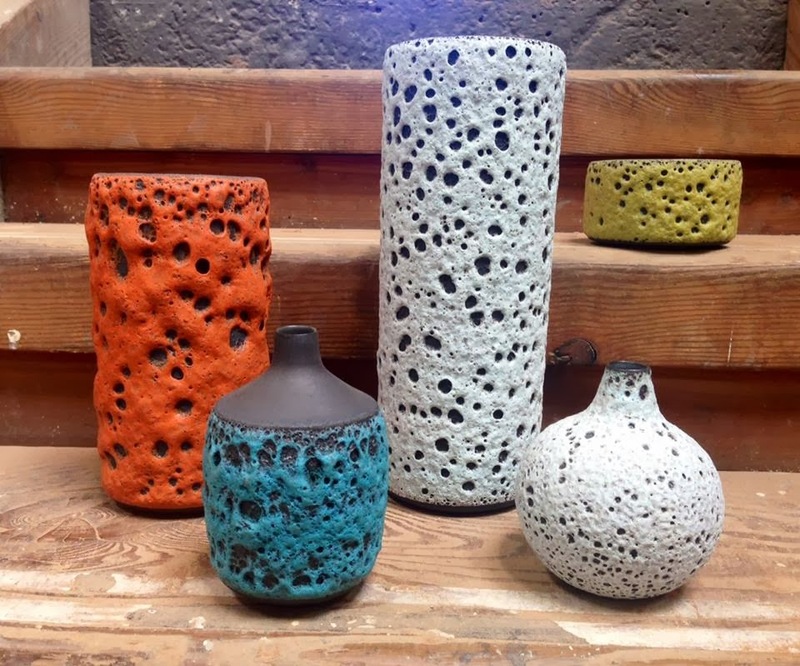 Check out his Volcanic Tube vases on Design Within Reach. 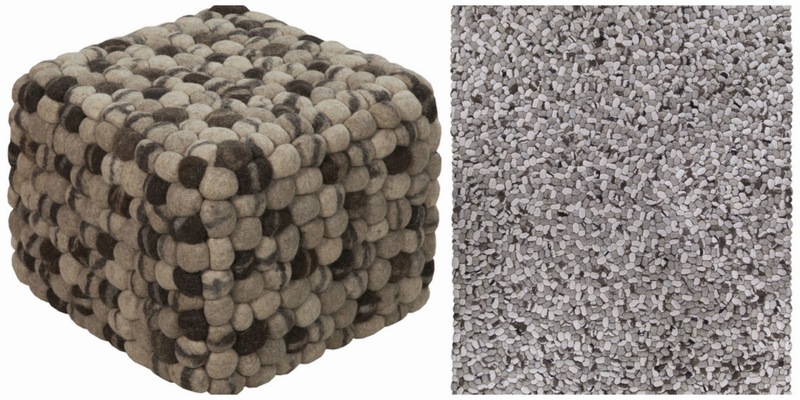 The contemporary Summit Collection (on right) by Surya creates a geologic inspired wool rug surface using a hand -knotting technique. Its felted wool looks so comfy cosy for your toesies! How about the Surya Pouf-14 (on left) using the same means of construction....I love its pebbled inspired look....adorable! 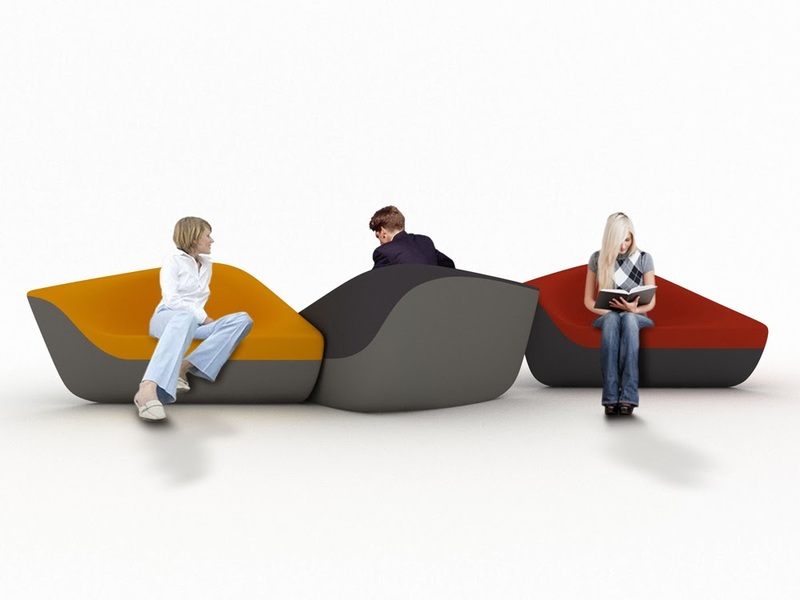 Seating stones designed by UN Studio for Walter Knoll was inspired by the rhythmic smoothness of geological formations. 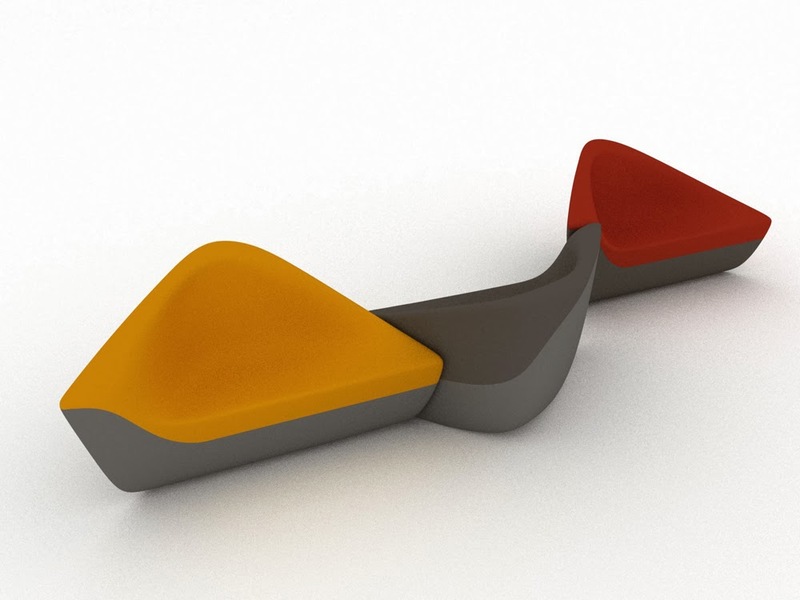 The sculptural Seating Stones exhibit a playful take on spatial awareness and versatility. The design presents a myriad of possibilities for placement, color, texture, arrangement and communication. Love it!